The strawberry plant is a low-maintenance berry-producing plant for home gardens that grows well in the Florida climate. Flower and berry production requires a temperature between 50 and 80 degrees F and 14 hours of light each day. Plant strawberries in Florida during the fall months--late September through October. Flower and berry growth begins in November; the harvest generally takes place in the months of April and May. Prepare a planting site for your strawberries in a full-sun location in mound rows made in a raised planting bed. Build the planting beds, with landscape timbers, 8 feet long, 4 feet wide and 8 inches high. Fill the planting bed 1/2 to 2/3 full with a well-draining top soil. Mix in 3 to 4 inches of organic compost or peat moss to increase the nutrient value and water-draining ability of the bed. Test the planting soil pH. Strawberry plants grow best in a pH of 6.0 to 6.8. Work ground rock sulfur into the soil to lower the pH number. Water the planting bed well after making amendments and let it rest for two weeks. Work a 10-5-10 fertilizer into the soil to a depth of 6 inches. Build mounds in the planting beds 12 inches wide and 8 inches high. Dig planting holes that are deep enough for the plant roots to spread out. Set the plants into the holes, spread the roots, and make sure the crowns are above ground level. Gently cover the roots with soil and tamp to hold in place. Plant the strawberry plants 18 inches apart. Spread clean straw mulch around the plants to assist with soil moisture retention and prevent weed growth. Mulch will decrease berry rot by keeping the leaves from sitting directly on the soil. Water the strawberries after planting by moistening the soil to a depth of 6 inches. Apply water to the soil instead of spraying it on the plants. Do not create pooling of water around the plant stems, as this promotes root and stem rot. Remove the plant blossoms that appear during the first year. 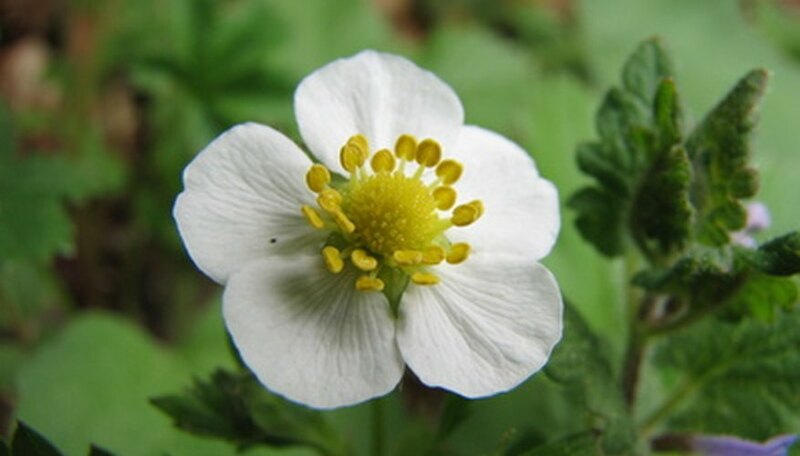 This will promote plant growth during the first year, which will increase berry production the following years. Strawberry varieties that grow well in Florida are Camarosa, Festival and Sweet Charlie.